Craft supply explosion? Tiny green soldiers scattered across your living room? Too many socks for your dresser? Just throw the whole shebang into our five quart storage buckets with lids. Choose from 16 solid bold colors to match any theme. Make adorable cubbies for siblings and school children; personalize your colorful storage bucket with stickers. Seriously, with these metal containers and lids you'll never need ideas for toy storage again. Order in single or 12 pack per case quantities. These buckets are built with steel and made in the USA. *Lid must be added to the cart separately. 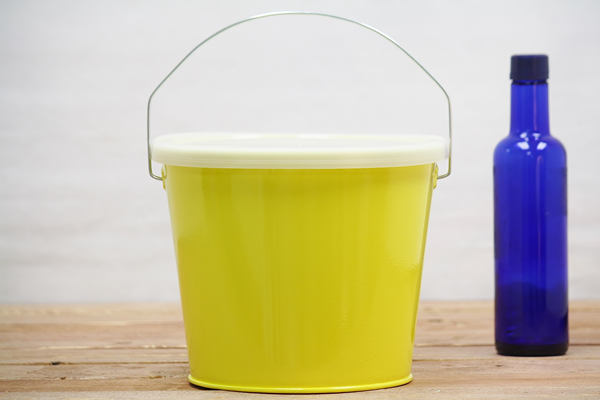 Can't get enough of these versatile storage bucket colors? Smaller buckets with lids are for sale in a 2 quart size. We also have colorful 10 quart metal buckets and very large 16 quart buckets.